1990/01/28 Portland, OR	Pine Street Theatre - While JAMC played this date, NIN probably didn't support, because of travel time involved. The first support date was probably Warfield in SFO. 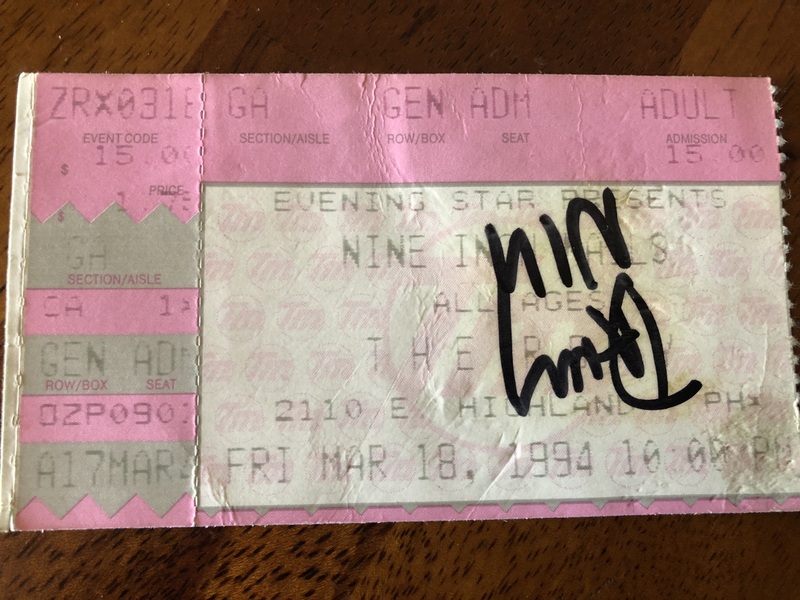 1990/03/27 Atlanta, GA - Were there 2 dates for The Roxy? 1990/04/03 Phantasy - Were there 2 dates for Cleveland? 1990/04/14 Washington, DC Lisner Auditorium - Did this one happen? The 9:30 Club headliner show the next night definitely did. 1990/07/12 Neptune, NJ, Green Parrot - This date originally solicited 1.5 months before as Chestnut Cabaret. Likely replaced by Drexel Univ. concert. Drexel and Chestnut Cabaret are located within 4 blocks of each other, so it's unlikely both happened. This guy's concert list shows that he went to many early NIN shows around Philly and to many shows at the Chestnut Cabaret. If NIN had played Chestnut, he would have been there. Instead, he only went to Drexel. So I think that confirms that Chestnut was probably cancelled, maybe replaced by Drexel, and Green Parrot slotted into the original Chestnut date. 1990/07/25 St. Louis, MO 1227 - unlikely they played the same venue within a month of each other. The 6/21 date is confirmed with newspaper solicits, and this one has none. 1991/01/22 Washington, DC	9:30 Club (1 AM show) - What was the proof for 2 shows on the same night? I forget. 1991/02/06 Hollywood, CA	Stardust Ballroom (Helter Skelter) - This seems to be a spurious 2nd date, maybe due to the VHS circulating? Ask Richard Alan White about what the date on his filming was, and if there were 2 shows. 1994/03/18 Phoenix, AZ	The Roxy - Did the second show happen at The Roxy? NIN Historian originally had The Grind. Some guy on setlist.fm also claims it was The Grind, though his anecdote does not actually provide any evidence to back that up. happinessinheresy's newspaper clipping shows both shows were sold for The Roxy, so if it changed, it was a last-minute venue change. Ticket stub confirms 2nd show was at the Roxy. 1994/03/27 Honolulu, HI After Dark - This was solicited in the newspaper, up to the day before the show, as a single date, Mar. 26, at After Dark. There is a ticket stub for the 26th on nintourhistory, but nothing for the 27th. Need to talk to Bill Rose, who did security there, about the show(s). 1995/11/11 St. Petersburg, FL	Jannus Landing (show went on as planned?) - This is the only date we're not absolutely sure went on as planned. 1995/11/27 Corpus Christi, TX	Cantina Santa Fe - This date probably is fake. Contacted JJ Nelson to try to find out. This page was last modified on 4 February 2019, at 00:13. This page has been accessed 86 times.